I have four recent projects that are off the needles but awaiting finishing. There’s also a few very old ones waiting around in the background…I’m thinking a finishing blitz is in need. But, pending that, I have something new on the needles. I’ve been off work all week so I’ve gotten a lot of knitting time in. 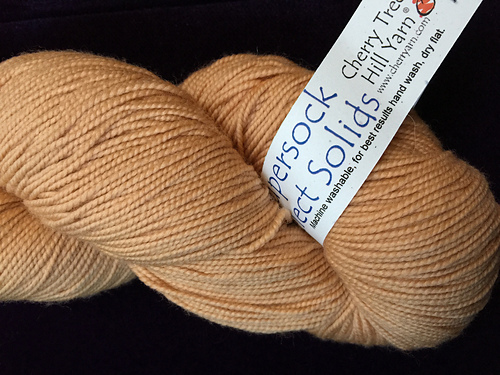 I cast on for Quicksilver using Cherry Tree Hill Supersock Select in Bark, Apricot and Hot Pink. For the first several rows, I wasn’t quite sure of the color combo, but it’s growing on me. I initially thought there was two much contrast between the browns. I wish the bark was a little closer to milk chocolate (mmm) and the apricot a little closer to camel, but I think it’s going to turn out well. I’m attempting to follow the pattern pretty closely (with the exception of swatching…didn’t do that this time around, but that’s a whole nother post). The only thing I’ve done differently is to carry the yarn up the side for the striped sections. 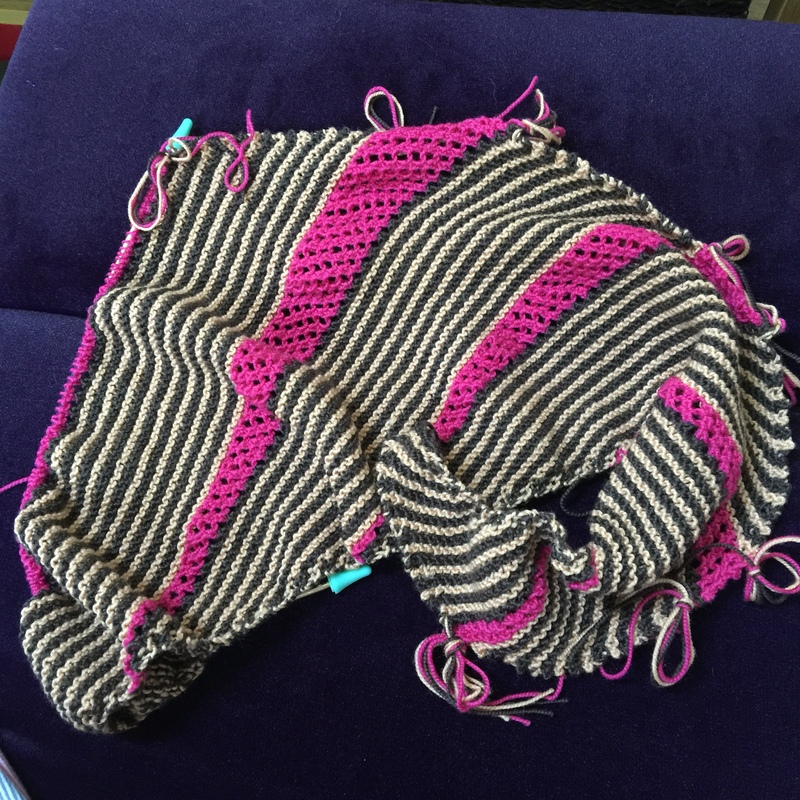 Someone asked about that in the Ravelry forums as the pattern doesn’t specify, and the designer answered that she and the test knitters had pretty much all broken the yarn between stripes. There is no way I will ever weave in that many ends. This would remain an UFFO forever instead. This pattern isn’t particularly difficult from a technical standpoint, but you do have to pay very close attention to where you are and what your stitch count is. I had one or two things I had to tink back a little to fix (once because I didn’t read the directions closely enough) but nothing major. I had to refresh my memory on how to do a long tail cast on but that’s not a big deal. It includes some short rows but no special techniques are needed to do them, so it’s as easy as turning the work and knitting back across. 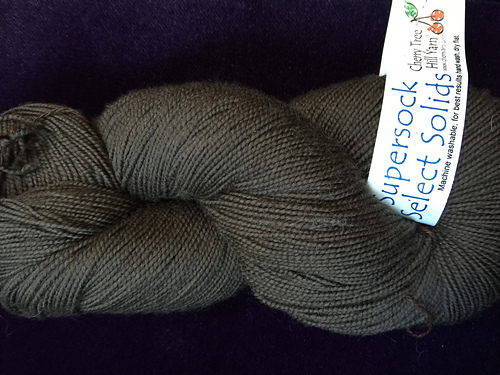 I like the yarn well enough, but it’s not going to be my new go-to or anything. Some of the reviews on Ravelry weren’t great. 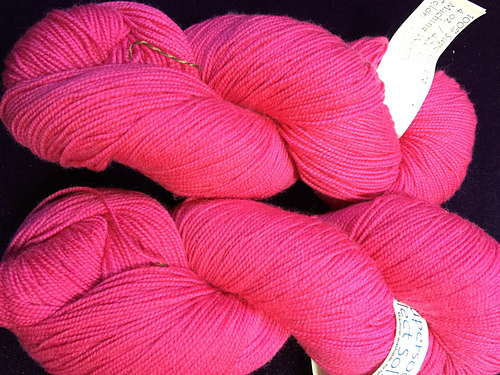 People commented on large numbers of knots per skein and excessive fuzzing/pilling after the yarn had been worked with a little bit. I didn’t encounter any knots at all, but have noticed a little bit of extra fuzz. It is fairly soft and squooshy, so I’ll definitely use up what I have. 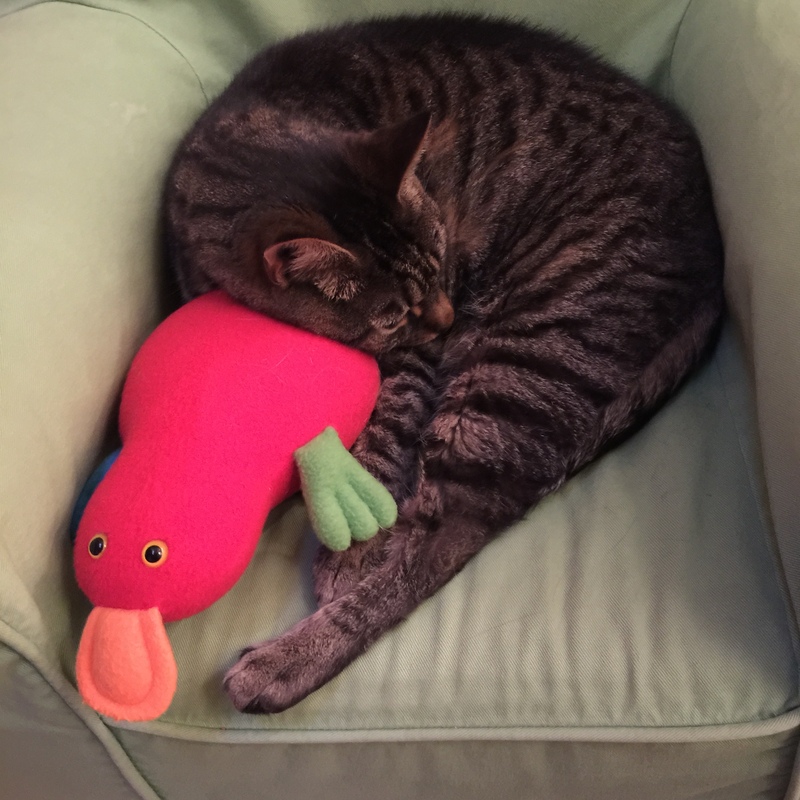 That’s Sammy, one of our stripeys, loving on my daughter’s platypus. Looks beautiful! I really like the colors you chose for this project, really fun.